Poet, painter, self-described funny guy, idiot, failure, pickpocket, and anti-artist par excellence, Francis Picabia was a defining figure in the Dada movement; indeed, André Breton called Picabia one of the only true Dadas. Yet very little of Picabias poetry and prose has been translated into English, and his literary experiments have never been the subject of close critical study. 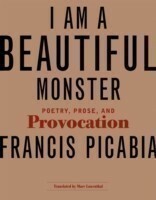 I Am a Beautiful Monster is the first definitive edition in English of Picabias writings, gathering a sizable array of Picabias poetry and prose and, most importantly, providing a critical context for it with an extensive introduction and detailed notes by the translator.